This chicken and corn soup comes in handy for me whenever I can’t think of what soup to cook for the day. I always keep one or two can(s) of creamed corn soup in my pantry. Best of all, this soup is very hearty, no fat at all. Corn is very nutritious and very good to our health too. My daughter loves this soup and would gobble it up without any complaints. Rinse chicken breast and drain well. Cut into bite sizes. Mix with marinade at least 15 minutes. Set aside. Open and pour the whole can of creamed corn soup into a saucepan. Fill up the empty can with water and add into the saucepan, together with chicken soup. Bring to a boil. Then lower the heat. Add marinated chicken, stir well and simmer about 5 to 8 minutes until chicken is cooked through. Turn off the heat. 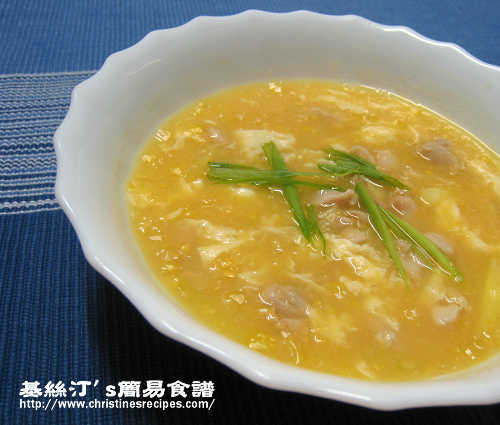 Gradually stir in whisked egg into the soup mixture. Sprinkle with spring onions. Serve hot. When cooking corn soup, don’t use too high heat. Stir occasionally and be cautious that would easily overflow. Turn off the heat, then add egg. The heat of the soup would cook it through. Otherwise the egg would be overcooked, losing its smooth texture. I used the creamed corn soup that has added a bit of salt already. So I didn’t need to add any salt. You might like to season with some salt if desired. i would love to see an english version of your recipes of the cantonese egg tarts! other than that i must say i really enjoy your blog, it has given me a lot of ideas of what to cook everyday! thank you and please keep updating us with new yummy recipes! The recipe of Cantonese egg tarts in English was posted this morning. Thanks for your love and support of this blog. I'll keep you updated with more recipes. Welcome you come back for more. What are you suppose to marinate the chicken with? The marinade was posted on this recipe already. omg i totally missed that i'm sorry!! but Thanks soo much for posting these recipes. Have you thought about doing recipes for Pad thai, beef cubes, or pho? Can anyone tell me what "gm" is equivalent to under the american scale? Chicken soup = chicken broth. You can easily get chicken soup from supermarkets. Can I make the creamed corn soup myself as we dont have it in the asian store. Also how to make the chicken soup? I got it from supermarkets. It's very popular. Every supermarket should carry it. You can make creamy corn soup with fresh corn kernels yourself, like this one. Mmm I just made this and it was excellent, thanks Christine. :) As usual your recipes are simple and full of flavour and comfort. In Canada, I ended up buying "Creamed Style Corn" in a can. Really cheap and has no actual cream in it. Incase any other readers are wondering it's the kind you can get from your super market brand or you can buy "Green Giant". Found very easily in non-Asian super markets. I think I'll also be keeping a can in my pantry at all times! Same here, I always keep a can of creamed corn in my pantry, just in case I crave for a quick soup. Your info is so helpful to my readers. Thanks a lot.